in bullet proof vest by suspect Ahmad Khan Rahami. NEW YORK (CBS NewYork) — A man being sought in connection with an explosion in Seaside Park, New Jersey and another blast in Chelsea is believed to have been taken into custody following a shootout, Linden police said. 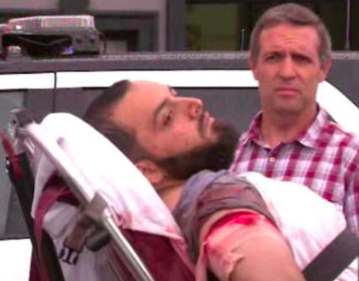 Authorities Monday had been looking for Ahmad Khan Rahami, a 28-year-old naturalized U.S. citizen from Afghanistan who was wanted in both incidents Saturday. Linden police said they found Rahami after officers responded to a call of a man sleeping in a hallway of a local business. When an officer approached the man, the man raised his head and that’s when the officer recognized him as Rahami, Capt. James Sarnicki with Linden police told CBS2.